BATTLE FOR WORLD / FOX NEWS | March 26, 2019: The video highlights that the left, the anti-Trump media, has been pushing the collusion narrative and conspiracies throughout the investigation probe by Robert Mueller, manipulating the public non-stop 24-7 to turn against the president. BATTLE FOR WORLD / ZEROHEDGE | March 20, 2019: The article highlights that in the wake of last week’s terror attacks at two mosques in Christchurch, New Zealand leaving 50 dead, several websites reported on the incident, hosted footage of the attacks, or have simply allowed people to engage in uncensored discussion such as Dissenter or Zero Hedge, have been partially or completely blocked in both New Zealand and Australia for the sake of “protecting consumers,” according to the CEOs of three New Zealand telcos. The shooting was broadcast over Facebook Live by accused gunman Brenton Tarrant to an initial audience of just 200 viewers (none of whom reported it) and had 4,000 overall views before it was taken down – Facebook deleted 1.5 million videos of the attack, of which 1.2 million were blocked at the time of upload. BATTLE FOR WORLD / CALEB MAUPIN | March 16, 2019: The video highlights that top Democratic Party donors and Soros are using contractor Christopher Steele and the company Fusion GPS to write another fake-news dossier for the corporate media to push, unleashing a new wave of scandal on Trump about Russian collusion and the 2016 election. The old dossier told lies about Michael Cohen, Trump’s attorney, sending him to jail. BATTLE FOR WORLD / NYPOST | March 16, 2019: The article highlights that CBS’ renewed call for $100 million in cuts has caused staffers at the broadcast company in a tizzy over who’s in and who’s out. Staffers of CBS’ news division are questioning who might be on the chopping block, especially as ratings for its morning and nightly news shows fall. And Gayle King of “CBS This Morning” is reported to be looking to at least double her $6 million salary! BATTLE FOR WORLD / MEDIAITE | March 16, 2019: The article highlights that failed Republican Senate candidate Don Blankenship has filed a massive defamation lawsuit on Thursday (March 14) against dozens of news outlets and media personalities for referring to him as a “felon” during his 2018 run in the West Virginia primary. Blankenship, the former CEO of Massey Energy, note the article, spent a year in federal prison after a misdemeanor conviction for conspiring to violate safety regulations prior to a deadly mining disaster in 2010, he was acquitted of all felony charges. 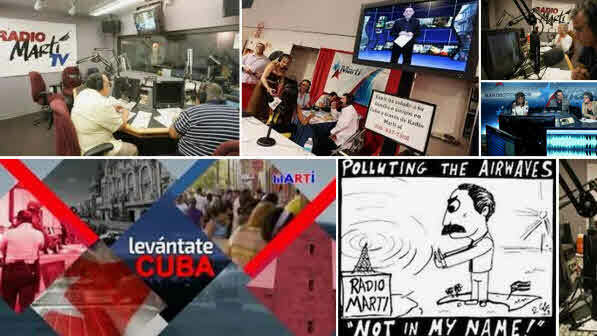 BATTLE FOR WORLD / MIAMI HERALD | February 26, 2019: The article highlights that four additional staffers at Radio and TV Martí have been fired over a controversial report broadcast last year that referred to Jewish philanthropist George Soros as “anti-Semitic” — bringing to eight the number of dismissals at the station so far following a month’s long internal investigation by the Office of Cuba Broadcasting (OCB), which oversees the Martí stations, as well as the Martínoticias digital site. The Martí report aired by Isabel Cuervo for the Antena Live program, spoke about conspiracy theories regarding Soros, who is identified as a “left-wing billionaire of Hungarian-Jewish origin” and a “nonpracticing Jew of flexible morals.” The broadcast was aired in three separate segments, included an interview that was posted on YouTube by RT.com. Cuervo and former News Editor Wilfredo Cancio were dismissed immediately after then US Senators Jeff Flake and Bob Menéndez demanded an investigation. 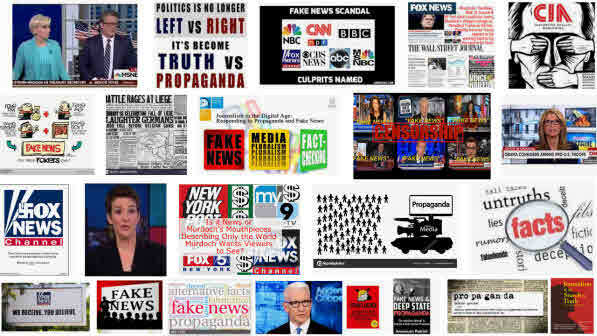 BATTLE FOR WORLD / WASHINGTON EXAMINER | February 26, 2019: The article highlights that in the United States the confidence in media has hit rock bottom, because many news consumers believe that reporters write articles before knowing the facts and 60 percent are under the impression that sources pay for stories, according to a depressing news survey by American journalism. The poll also confirmed the pending death of print: newspapers and magazines; and the shift to social and online media for sources of news. The grim findings that journalism faces, some key areas were listed as: The traditional press led institutions of trusting news, to which the public had the lowest confidence. 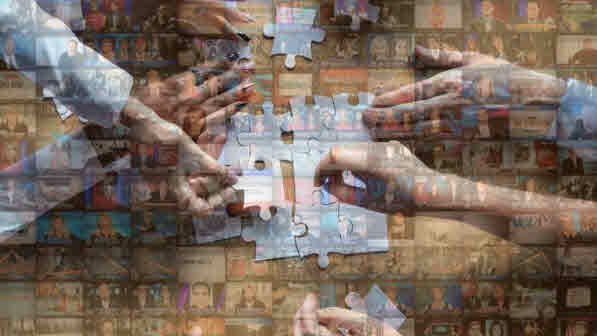 The survey says: 40 percent get their news from television; 40 percent use online and social media sources to get news; a low 6 percent get their news from the traditional newspapers and magazines; 60 percent share the believe that sources pay reporters; 41 percent say they do not believe stories with anonymous sources; and 42 percent of Democrats polled believe that the media isn’t biased, while a low 10 percent of Republicans said the same. So the traditional news media platforms are in a state of uncertainty, with trust issues, as news stories become more politically driven with some form of character assassination in sight or scores to settle. The current state of news media thuggery expanding. BATTLE FOR WORLD / FOX NEWS | February 17, 2019: The video highlights that President Trump is ‘not happy’ with the border deal from Congress and has declared a national emergency freeing up additional $8 billion. The president said that what we want to do is simple and not complicated. We want to stop drugs, criminals and gangs from coming into our country. That the U.S. is being invaded with drugs and criminals coming through the border and a wall would make the process of stopping the inflow easy. The Democrats have threatened to take Trump to court over the building of the southern border wall. Acosta: What do you say to your critics who say that you’re creating a national emergency. That you’re concocting a national emergency here in order to get your wall, because you couldn’t get it any other way. Trump: I asked the Angel Moms… Do you think I am concocting something? … Ask these incredible women who lost their daughters and sons, OK. Because your question is a very political question, because you have an agenda – you’re CNN, you are FAKE NEWS. BATTLE FOR WORLD / RT AMERICA | February 19, 2019: The video highlights Jimmy Dore, host of “the Jimmy Dore Show” joins Rick Sanchez to discuss establishment media’s shift to pro-war propaganda. He balks at how the smartest broadcast journalists of NBC and CNN have been reduced to “Alex Jones level conspiracy theorists” and is particularly appalled at their smear campaign against presidential primary candidate and US Representative Tulsi Gabbard (D-Hawaii). We all knew it was coming, but the thing that was bizarre is the heavy handed gestapo tactics. We said in the opening a dozen agents, but I thought I heard Roger say 29. Edward Szall: Twenty-nine agents, seventeen cars. They are treating him like he’s a gestapo. Rick Wiles: Twenty-nine agents heavily armed to arrest a senor citizen who posed no threat. Doc Burkhart: At six in the morning. Rick Wiles: That quinky dink that you like to talk about, CNN was there with their cameras at 6AM. Isn’t that amazing that CNN just, a lucky guess, they just decided: probably it’s going to be Friday morning at 6AM that Roger Stone gets arrested. We are just going to go there and stake out the front of his house and just see if our hunch is right. Now you know, without a doubt that the FBI, the Robert Mueller team tipped off CNN. It starts to look like CNN is actually a branch of the Federal Government. They work together. And think about how frightening that is. That we have a police state in this country (the USA). What happened today (January 25), we have turned a page in American history, you now go to prison for your political views and your political activity. That’s where we are at now in America. If you are on the wrong side of a political debate you may go to prison. BATTLE FOR WORLD / GRABIE NEWS | February 4, 2019: The article highlights the craziness and stupidity regarding the investigation being conducted by former FBI director Robert Mueller (Muller), accusing President Trump of Russia collusion, and on Friday (January 25) saw the grand jury he impaneled hand down an indictment. CNN, meanwhile, did not disclose who affiliated with the Muller probe offered these updates. The network’s report began with a reference to “sources briefed on the matter” but never said who those sources are. BATTLE FOR WORLD / RT | February 5, 2019: The article highlights that the Fox host Tucker Carlson offered his take on CNN filming a surprise FBI raid on Roger Stone’s house, saying that the CNN channel has turned into the “PR arm” of Robert Mueller, “the single most powerful” – and unelected – man in the US. The Fox anchor said it’s crucial to raise some questions before the arrest of Roger Stone – an associate of Donald Trump – fades from the headlines. Stones’ arrest was almost entirely devoted to a CNN crew being conveniently present at the early-morning FBI raid on Stone’s Fort Lauderdale house. And the question is being asked: “How did CNN know about a raid that was supposed to be a secret? 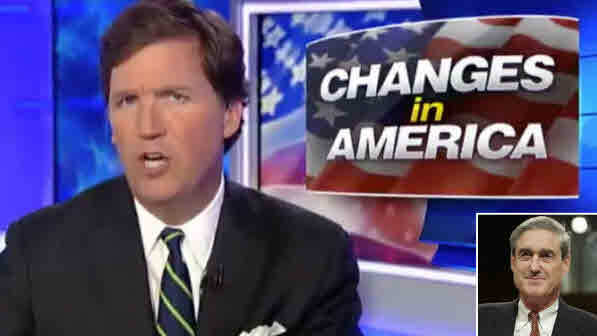 Did they learn from [Robert] Mueller’s team?” Carlson asked. Shortly after the raid, likened to “a military assault,” speculation began to spread that the network had an inside track with the FBI or Mueller’s team. 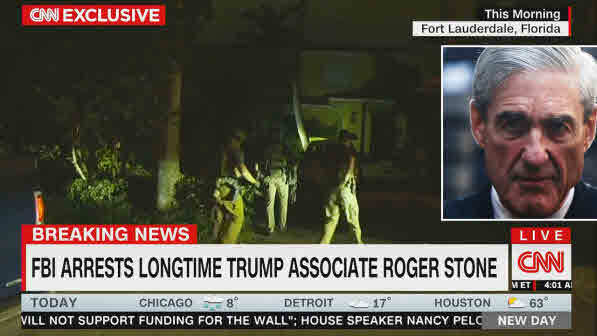 BATTLE FOR WORLD / PRISONPLANET | February 5, 2019: The audio highlights that Roger Stones’ neighbors confirming that CNN was setting up 30 minutes before the arrest by FBI. And that Senator Graham is launching an investigation. Roger Stone: This is indisputable proof that CNN producer was sent a draft copy of my indictment which was sealed a day prior, to my address. Leaks by the Special Counsel’s Office to the media or anyone are specifically illegal. …This had been proven by the metadata tag to be a draft of my indictment that was sent to CNN; and this explains why CNN was at my home roughly fifty minutes before I was arrested. …This I think destroys the idea that they were operation on a hunch. And my lawyers figured this out…and they have forwarded to Senator Graham, to Congressman Mark Meadows, to Congressman Jim Jordan, to Congressman Matt Gates; members of the House Judiciary Committee. And this I think indisputable prove what I said last week – that CNN was allowed to film the public humiliation of not only Roger Stone, but his 71 year old wife who’s charge with no crime whatsoever, but made her stand in the street barefooted in her nightgown after this stunning predawn raid at my house. CNN is busted. Prior to this it was an allegation: This absolutely proves that there has been a violation of the law. BATTLE FOR WORLD / RT AMERICA | February 8, 2019: The video highlights, RT America’s Dan Cohen, reporting for the News with Rick Sanchez on the ominous development of internal propaganda in the United States. The State Department’s “Global Engagement Center,” created by the Obama Administration in 2016 to counter Islamic State, has resurfaced under the Trump Administration taking aim at Russia and China. BATTLE FOR WORLD / SPUTNIK NEWS | February 8, 2019: The article highlights that the US State Department announced this week (first week in February) that former Fox News reporter and ex-CIA operations officer Lea Gabrielle would be employed as the head of its “Global Engagement Center,” in charge of countering foreign propaganda and disinformation. Gabrielle adds to the list of Fox News personalities to be employed by the Trump administration, and follows the likes of Heather Nauert, who was appointed recently as the next US ambassador to the United Nations. And also Bill Shine, former Fox News executive, presently serving as the White House deputy chief of staff for communications. How Much Power Does Israel Have in America? BATTLE FOR WORLD / TRUNEWS | February 8, 2019: The video highlights an old interview with the Shah of Iran, being interviewed in 1976 by Mike Wallace. The Shah spoke about media control and by whom, and later a revolution was brought about in his country in 1979 and he was removed. TruNews claims that Youtube is shadow-banning their videos. BATTLE FOR WORLD / TASS | February 12, 2019: The article highlights that British media regulator Ofcom is considering the introduction of sanctions against Baltic Media Alliance Ltd, the license-holder of two Russian TV channels (NTV Mir Baltia and NTV Mir Lithuania) over their failure to be impartial in covering, according to the regulator’s report released on Monday (February 11). 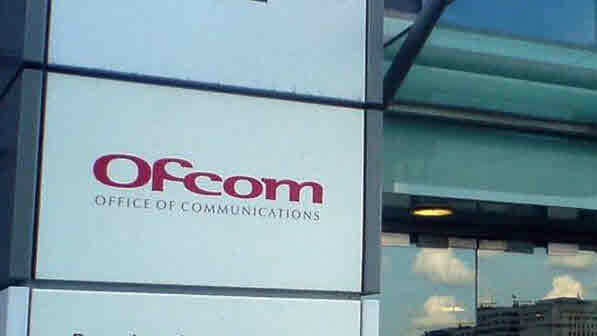 Ofcom complaints targeted two broadcasts on NTV Mir Baltia on April 2 and 3 last year (2018). According to the regulator the violation occurred in the Segodnya news program, where a discussion was held on April 2 on the poisoning of Russian ex-Colonel Sergei Skripal and his daughter Yulia in Salisbury. BATTLE FOR WORLD / SPUTNIK NEWS | February 12, 2019: The article highlights that Western media has tried to paint a picture of a Venezuela on the verge of a collapse, coup or catastrophe, in which Venezuelan President Nicolas Maduro increasingly desperately clings to power against the wishes and needs of his own people. However, two reporters inside the country told Sputnik this is very far from the truth. The reality is that three quarters of the international community is behind Maduro, and the country is operating more or less as normally as it was before Juan Guaido, the speaker of the country’s National Assembly, declared himself to be interim president on January 23. Maduro’s caution and skepticism of the Trojan horse of international humanitarian aid is completely justified, given the figures in Washington who are overseeing it, two journalists in Venezuela told Sputnik Monday (February 11). Listen to “Trump & Democrats Push “Fake News” About Venezuela” on Spreaker.